The Practical Handbook of Investigation is an authoritative and comprehensive information resource for people with any level of experience of incident investigation. Produced in an easy-to-use, well organised format, it offers 120+ pages of information on how to investigate an incident from planning the investigation, conducting the investigation, interviewing those involved and analysing investigation information to final report writing. Specific issues and topics within these sections are laid out alphabetically for easy reference and are accompanied by graphics and illustrations. 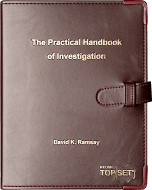 The handbook is intended to be an easily accessible resource for people who are conducting investigations or need to refamiliarise themselves with the issues and ideas involved such as interviewing techniques and data collection. This 120+ page handbook is produced in an A5, ring-bound format, with a robust and attractive exterior. David K. Ramsay is Group Managing Director of The Kelvin Consultants and Kelvin TOP-SET Companies. David originally qualified as a food and dairy technologist but went on to study technology and its application in business in much greater depth. His particular interest was in the area of systems performance and systems failure and this led to the development, over twenty five years ago, of the Kelvin TOP-SET® incident investigation system. He is also interested in the relationship between creative thinking and investigation. David has spent many years conducting incident investigation courses in diverse global locations and leading or facilitating major investigations. His investigative experience spans many industrial sectors, including air crash investigation, oil & gas, rail, nuclear, shipping, and explosives. He was also involved in the investigation of the Deepwater Horizon disaster in the Gulf of Mexico in 2010. David now concentrates mainly on the strategic development of the Kelvin TOP-SET group of companies, overseeing all investigations and the development of new products. “A well laid out book with clear and easy to understand techniques including: planning the investigation, gathering information, managing the investigation, root cause analysis, interviewing techniques (very useful) and how to write incident reports. The TOP-SET system is generally seen as one of the leading incident investigation systems due to its ease of use and adaptability i.e. it can be used for 'minor' incidents as well as large scale incidents.” – K. McIntosh.